The keywords at the bottom of the Bandcamp page for this album suggest it encompasses ambient, ambient folk, drone, electronica, experimental, lo-fi, post-rock, and shoe gaze. Can you really fit all that into four tracks and 22 minutes? Apparently, yes. At the very least, you can pour a bit of it into each song. Slowwave Perception is immediately engaging, offers plenty of cool sonic touches to keep you listening, and should leave you wanting more. Your introduction to the Dead Melodies sound slides in quietly with “Sycamore Rain.” A four-note arpeggio builds over hissing pads. Listen for the bits of texture that precede a vocal drop, a conversation between (it sounds like) a pilot and the control tower. Soft guitar noodling makes an appearance, and the whole thing is wrapped in patient calm. The title track is little more than a shifting whisper in your head, with sounds like muted brass taking the front. The background pads churn and burble. There are brief moments of rising intensity that feel like they might want to become something bigger, but then they sigh and sidle back down into softness. A long, near-silent pause mid-track acts as a breather before the process repeats. A beautiful track that takes a lot of its beauty from restraint. The slow lope of “Radars & Stars” wraps itself around whispered vocals to capture both the post-rock and shoegaze sides of things. “Laze” opens in an ambient space with echoing, far-off pads washing past. A beat like the steady cadence of machinery mixed with a familiar house riff on drums slips in and out, its arrival and subsequent returns very welcome. A shot of wavering EDM keys toward the end are a nice touch. 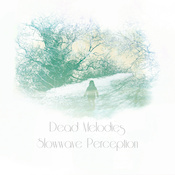 Slowwave Perception is an excellent debut, if a bit brief. But there is so much going on and such great attention to detail that it rewards deep repeat listens. In addition, if this where and how Dead Melodies begins, I fully intend to keep listening to see what comes next. (A second release has come out since this one was sent to me.) Take a listen; I bet you’ll want more, too.